Sometimes you come across a quilt kit or piece of fabric that you know will be perfect for someone. That happened to me not too long ago in my "home away from home" quilt shop in Perham, Minnesota. I went into Bay Window Quilt Shop looking for something else but no sooner had I walked in the door when I passed by a new display of fabrics from Shelly Comiskey for Henry Glass Fabrics called Bee Happy. 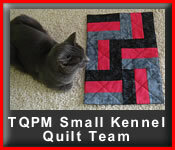 They had a couple of quilt kits cut and ready to go with an accompanying free pattern. It caught my attention and I thought of Heather, my friend and owner of The Quilting Hive in Twisp, WA. 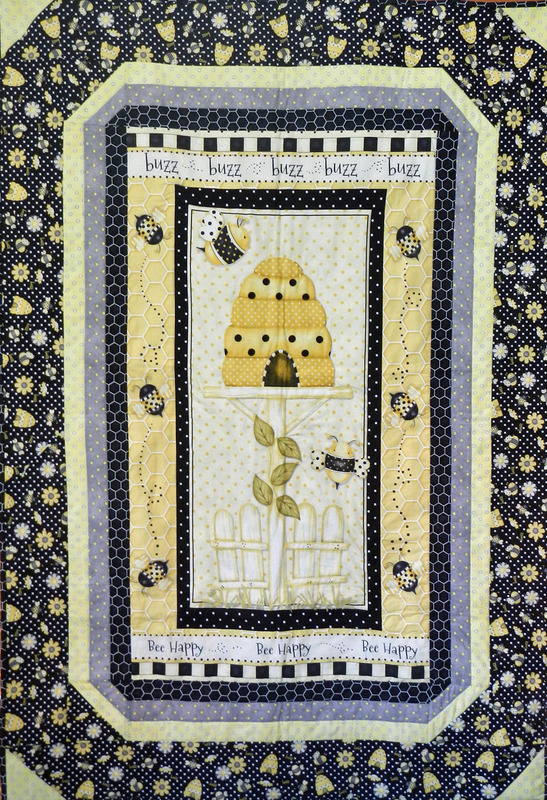 She always has a bee-themed fabric in the shop but I hadn't seen this line on my last visit. I bought the kit and enough fabric for backing and set to work on the quilt. It was going to be a gift for her. Using my inexpensive Brother machine in my hotel room, I was able to assemble the quilt top in no time. Then using the same machine (which was a bit more challenging), I quilted the top using stitch-in-the-ditch and straight stitch outlining. I finished the binding this week and delivered the quilt today. Heather was very surprised. It wasn't her birthday or anything special like that. It was more like a friendship quilt. What fabric or kit have you bought on impulse for someone else? Share it in the comments. I would really LOVE to buy the fabric in the upper left corner of the above picture. How can I purchase it and for how much? I bought this fabric four years ago. I am not sure you can find it any more. Try doing a google search. I know Shelly Comiskey has done other bee themed prints. Maybe she has a newer print with a similar theme.